Henry F. Younkin was born on Feb. 8, 1805 in Turkeyfoot Township, Somerset County, the son of Johannes "Frederick" and Catherine (Patton) Younkin. He and his adult children were early pioneers of Kansas, paving the way for many other Younkin kinfolk to migrate there over the decades, leading to a Kansas Younkin Reunion in the mid-1930s. On Dec. 21, 1827, when Henry was age 22, he married 17-year-old Mary King (1810-1903), daughter of John Christopher and Delilah “Hiley” (Rush) King. The old King homeplace commonly was known as “the Harned farm” in Turkeyfoot. They went on to produce a dozen children, all born in Pennsylvania – Jeremiah Younkin, Moses Younkin, William K. Younkin, Delilah “Hila” Faidley, Catherine “Cassie” Myers, Alfred Younkin, Harrison K. Younkin, Silas Younkin, Rachel Myers, John Younkin, Ross Younkin and Mary E. Stewart. Said the Somerset Herald, Henry "was known as one of our best citizens, commanding the respect of all who knew him." When Henry's father died in 1843 without having left a will, Henry and his brother Frederick agreed to serve co-executors of the estate. Henry filed a lawsuit in the Orphans Court of Somerset County, asking that an inquest be granted to partition the farm among the heirs "without prejudice to or spoiling the whole thing." If the partition could not be so made, he then asked that it be divided "conveniently" to accommodate two or more of the heirs. On Aug. 31, 1843, just 24 days after the father's death, a sale was made of his farm implements, raising $111.33 in cash proceeds. At that sale, Henry bought a chopping axe, cant hook and hogs (third choice). Early view of unpaved Main Street of Wakefield, Kansas, where in 1874 Henry F. Younkin joined some of his adult offspring who had migrated there in 1856. Circa 1844, when their son Silas was born, the Younkins resided at Paddytown, Somerset County. During the Civil War, seven of their offspring joined the Union Army -- sons Moses, Alfred, Harrison and Silas -- sons in law Daniel H. Myers and John H. Myers -- and grandson in law Seneca Randall -- with Silas shot in the face at Chancellorsville, and Alfred dying “in the service on the western frontier,” said a newspaper. Harrison was “shot entirely through the chest, at the battle of Fair Oaks, his life being saved by having a silk kerchief drawn through the wound.” Many years later, the Clay Center Times said: "To have sons to give to the country at such a time is no small honor and shows something of the patriotism of this family." In the postwar years, many more of the adult Younkin children and nephew John King traveled westward to seek their fortunes in Kansas. Lured by the opportunity to join the adult family in the midwest, Henry decided to sell his farm and join them in Wakefield in 1874. Only sons Harrison, Silas and Ross -- who spent some years Wakefield before returning -- ended their days in Somerset County. Mary outlived him by 23 years. The Clay Center Times said that "...Mrs. Younkin was a woman of marvelous energy and she made great sacrifices during those pioneer days to raise her large family. Her trials and sacrifices none but God knows -- none but he can measure." Following her husband's death, when she was age 70, Mary filed a claim with the Commissioner of Pensions in Washington, DC. She stated that she had no way to support herself because she owned no property nor had a source of income. Because she once had been dependent on her late son, Alfred, she said, she was entitled to compensation for his loss. Friends D.D. Reed, James J. Reed and John Faidley of Wakefield filed documents supporting her position. On Dec. 18, 1895, at age 88, she was mentioned in the Somerset Herald newspaper in her old home region, in a letter written by her husband's cousin Nessly Younkin, calling her "venerable ... and in the enjoyment of good health" and reporting that she lived at that time under the Myerses' roof. She passed away in the Myerses' Wakefield home on Aug. 7, 1903, at the ripe age of 93. Reported the Clay Center Times: "Her death was quite sudden. In usual health until a few moments before, she passed away as an infant goes to sleep." Her funeral service was preached by Rev. W.H. Underwood, at the local school house, with help from Rev. Wyant of Wakefield. She was laid to rest beside her husband in Timber Creek Cemetery. The Times said that she was survived by 67 grandchildren, 94 great-grandchildren and three great-great grandchildren, covering five generations and a headcount of 176 individual lives. Their migration to Kansas is described in the 1928 book by William Elsey Connelley, History of Kansas, State and People. Henry and Mary and their children were remembered in April 1937 when an inaugural Kansas Younkin Reunion was held in Wakefield. They were named in a local newspaper article about the reunion as well as in the initial edition of the Younkin Family News Bulletin. At that reunion, their great-great-grandson, Rev. Francis V. Tannehill, preached a sermon during morning worship services in the Methodist Church in Wakefield. Younkin Reunion in Wakefield, Kansas, 1937. Son W. (or H.) "John" Younkin (1850-1909) was born on July 12, 1850. He apparently never married or reproduced. In 1892, at the age of 42, he made his home in or near Bellingham, Whatcom County, WA. In January that year, when he received word of the brutal attack endured by his brother Moses, he immediately came to the home of John Bennett where his brother lay dying. The account was described in detail in the Whatcom (WA) Daily Reveille newspaper. He remained in Bellingham for the rest of his life, "living in the vicinity of Van-Wyck," reported the Bellingham Herald. Suffering from kidney affliction ("Bright's Disease," he died at St. Luke's Hospital at the age of 58 on May 10, 1909. News of his death was telegraphed to his brother W.M. 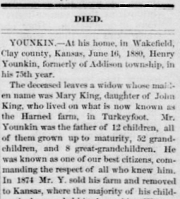 Younkin in Wakefield, who in turn sent one back "requesting that the body be interred by the side of his brother, the late Mose Younkin, who was murdered...."
Research notes compiled in the 1930s in Pennsylvania by Otto Roosevelt Younkin confirm that John "never married," that he died in Bellingham, and is "possibly burried in same Cem. as his older brother Moses." If so, he rests in the Bayview Cemetery in Bellingham. Research for this page graciously shared by the late Donna (Younkin) Logan, Marian (Smith) Posey, Laurel Posey, Loretta (Adams) Kelldorf, Blair E. "Junior" Younkin Jr. and Kay Lynn Younkin.